A team of friends, lots of coffee, and a drive to create. That’s what SCAD Atlanta students brought to the table for the 10th anniversary of Generate: A 24 hour, cross discipline art challenge. Two weekends ago, the best and the brightest at SCAD came together to pull an all-nighter, and test their skills. Every year sees a new host, a different challenge, and a few unexpected wrinkles. 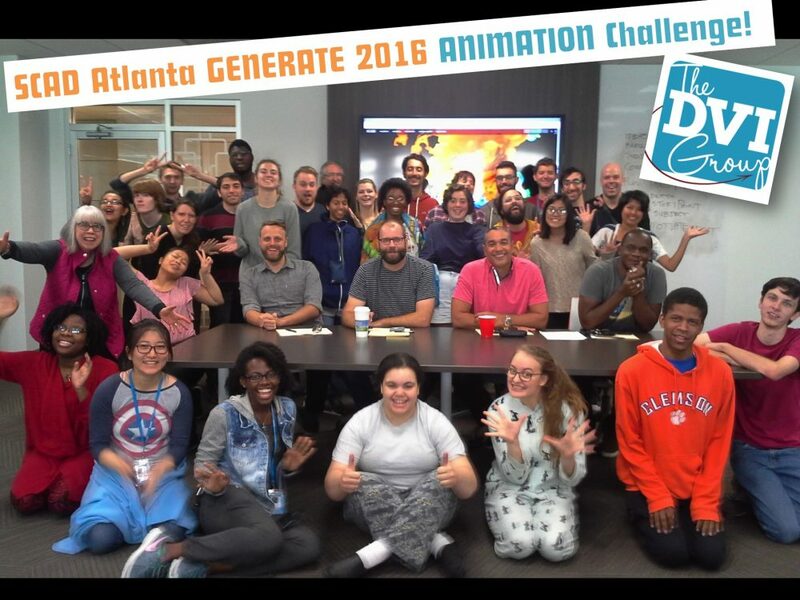 DVI was thrilled to be invited to host the animation challenge for this year’s Generate. Since every host comes up with a unique challenge for the students, we decided to put their client communication skills to the test. For our challenge, students were given a fictional creative brief, and asked to come up with three unique concepts complete with character studies, treatments, and 2-3 style frames. That’s no small ask in a 24 hour period, but the students were definitely up to the task. While we went home to enjoy our warm beds, the students strapped on their work pajamas and got down to the business of concept design. The next morning, when all the dust cleared, we came in to find several dozen pairs of bloodshot eyes and some really impressive concepts. Coming up with great creative is no small task, and communicating those ideas to a client can be even harder. The students had a great time coming up with ideas and got a chance to present their work in a professional setting, getting the kind of feedback a client would give, and tips on how to improve their next pitches. All in all, Generate 2016 was an amazing experience for us, and we hope we get more chances to work with the amazingly talented artists studying at SCAD.